JVC unveils new 4K HDR projectors and red special edition DLA-20LTD | What Hi-Fi? Celebrating the 20th anniversary of its D-ILA chip, JVC has launched the DLA-X9900, DLA-X7900 and DLA-X5900 projectors – and a limited edition red DLA-20LTD. What's D-ILA? It stands for 'Direct-Drive Image Light Amplifier' and it's JVC's proprietary chip for displaying images. It's a kind of hybrid of LCD and DLP projector technology that JVC has been using since 1997. So for its 20th birthday, JVC has launched three new D-ILA projectors with Ultra HD 4K resolution and promising improved High Dynamic Range (HDR) pictures. 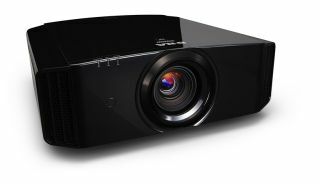 All three projectors use a new, redesigned "e-shift5" technology, which is JVC's way of displaying native 4K images, by cleverly shifting Full HD images by half a pixel diagonally at 120Hz, thus multiplying the resolution to reach 3820 x 2160. The DLA-X9900 and X7900 are THX 3D certified, and the X9900 has a claimed 2100 lumens of brightness and an 'industry leading' 160,000:1 contrast ratio. JVC's Multiple Pixel Control processing technology has been improved as well and combined with the new e-shift5 tech, aims to deliver better 4K and HDR10 images than before. All three projectors come with HDCP2.2 certification for their HDMI inputs, which also support 4K/60fps and 4:4:4 colour subsampling. The X9900 is available in black only, while the X7900 and X5900 are available in black or white finishes. All three are due in October, and cost £9500, £6300 and £4500 respectively. JVC will also be releasing a limited edition DLA-20LTD - that bright red projector pictured above - to celebrate that 20th anniversary. Why red? Red is JVC's corporate brand colour and it "expresses the passion and enthusiasm" for developing future D-ILA projectors, says JVC. Details on the 20LTD are sparse, but it will feature another "industry leading" native 200,000:1 contrast ratio, and the 20th anniversary logo will show up when the projector is fired up. We'll update with more details and pricing when we know.